Jacob Resch is a talented young musician from Floyds Knobs, Indiana. Now 23 years old, Jacob started playing the guitar at the age of 8. Jacob finds inspiration in his surroundings, experiences, and other music. He finds himself listening to nearly every musical genre and his favorite musicians range from Frank Sinatra to Led Zeppelin and from Kid Cudi to Bruno Mars. With the help and influence of musical mentors, Jacob recorded and released his first EP entitled, “On the Rocks,” which has been featured on radio stations, WFPK and Crescent Hill Radio. 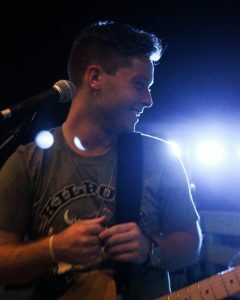 Jacob has played concerts regionally at notable venues such as Headliners Music Hall and Rhino’s. Jacob has also sold records around the world. Jacob has released a number of singles since his first EP, all of which have received airplay and international recognition. In 2016 his short film “Cali Girl” was featured in the Hamilton Music and Film Festival in Toronto, Canada.